This is one of our newest heirloom dresses. We have been wanting to design a voile overlay dress and this just turned out beautifully! It is similar to our other smocked pearl dresses EXCEPT that that design has a batiste dress with only Italian organdy sleeves and collar. 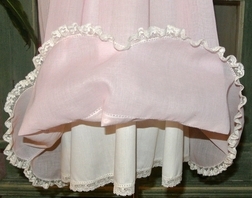 This dress is ENTIRELY is made of the beautiful pink voile (similar to the organdy) and has an ecru batiste underslip. The collar is smocked in ecru pearls and embroidery with the sleeves and the collar embellished with ecru French lace. 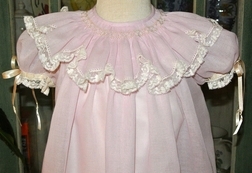 The sleeves have beautiful waffle beading in ecru with ecru satin ribbon. 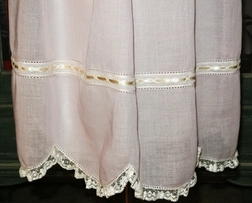 The bottom of the dress is similar to the other pearl dresses in that it has beading and satin ribbon, is scalloped at the bottom and trimmed in French edging lace.